Nearly 100 subsidised bus routes have been scrapped by councils in Wales in the past three years, with further cuts expected as authorities make savings. The figures obtained by BBC Wales reveal that nearly one in seven routes across 19 council areas have been axed. The charity Age Cymru warned of the impact this could have on older people saying they could become increasingly isolated and cut off from services. The Welsh government said it was reviewing ways of funding services. But a spokesperson also added that decisions on support for local service remained with councils. Responses to a Freedom of Information request show 93 services have been cut from 656 subsidised routes between 2011 and 2014. 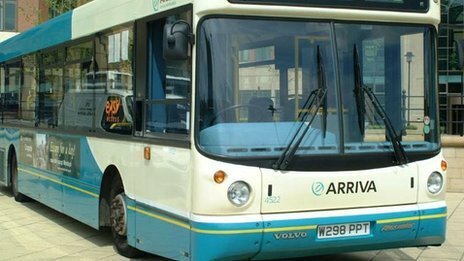 Some councils warned they were continuing to review bus services following cuts to transport budgets after a 25% reduction in Welsh government funding. Mavis Jones, a regular bus user in Brymbo, is near a bus route which is at risk in Wrexham. She said: "I'd be stuck in the house and I wouldn't be able to go out at all because we haven't got a car and we don't drive, so the buses are very important. "It would affect the elderly dreadfully. They wouldn't be able to go out to contact anybody, to have a chat or go anywhere at all to meet anyone. They'd be like prisoners in their own home." In a statement, Wrexham council said: "At this time, no services have yet been identified as being cut or withdrawn. "The budget will be discussed by full council on 26 February and we are awaiting to see what funding, if any, will come from the Welsh government after April." The latest figures on service cuts follow a report by the charity Age Cymru last December. In it, the charity claimed there was a lack of bus services in many communities. Spokesman Iwan Rhys Roberts said: "Older people will become increasingly isolated and cut off from services. They will not be able to access the services that they need. It's a big concern for us." Responding to the bus service cuts, a Welsh government spokesman told BBC Wales that the transport minister was looking for "innovative solutions" to deliver an efficient, sustainable bus service across Wales. "But local authorities are responsible for determining how they spend the funding we provide and identify which services should be supported and at what level," added the government spokesperson.